My national express coach pulled off the M1 at J21 at 4am on a very cold November morning last year. Fresh from Morocco with my wetsuit still well, wet and my hand, foot and face tan still glowing. I had just 4 hours sleep to look forward to after a long journey from Agadir via London. The next morning I was on the first bus to Birmingham to meet up with Landlocked Surfgirl for the first time (read about it here) following our whirlwind internet friendship. This first real world encounter would lead to a firm friendship and many more meetings to come. We have a mutual affliction, we are both Landlocked and obsessed with surf, sea and all things coastal. 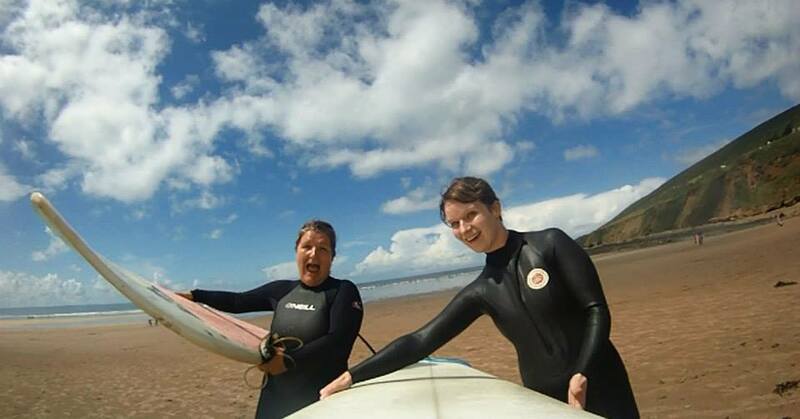 We feed each other’s enthusiasm and empathise with each other’s quite dire post surf trip blues. We chat every few days, we are always hatching some plot or scheming some scheme as we discuss our escape plans. We meet when we can and we have finally had a surf together this summer. Most of all, we can talk for England and I mean talk, just ask Mr Landlocked. Last time we met for a landlocked lunch we went to Turtle Bay in Birmingham ( a tenuous link to the coast if ever there was one) and I predicted that within 5 years we would both be living in Cornwall and surfing whenever we wanted. I strongly believed this but, had no idea how or when this would happen. I felt that we were both so far away from living by the coast, not just due to geography, that 5 years seemed reasonable. At the time I was working fulltime with just 4 weeks leave a year (read here about how I changed that) and Landlocked Surfgirl was tied by her house and job, amongst other things. Maybe there was more than a little trepidation on both of our parts too. This was just 5 months ago. As of last week the Landlockeds have sold their house and are headed to live in Cornwall, something they had deliberated over for a while but, in the end happened almost suddenly from decision to deal done. They are making the big move really soon. This is a huge step for Landlocked and her husband. As of yesterday I began my new 39 week a year contract at work and tomorrow I’m headed down to Newquay. I’m going with my best girlfriend for a change and I’ll be looking at a little flat to rent on Pentire Headland for 6 weeks next summer. This is a little step in the right direction and lucky for me my friend will be living close by too. The flat overlooks South Fistral , side on so I can check the swell from my terrace. It’s in my favourite, quiet part of Newquay and although I know that summer may not provide the best surf and will be super busy, I also know you can always find a quiet corner and a small wave and that a single fin long board is just made for summer. I could go off somewhere exotic but, I’d really like to stay in my own country and meet some new friends, hang out with the newly transported Landlockeds and who knows maybe even establish something of a life down there that could lead to a move in the future. I want to explore more of Cornwall. I’d like to have friends from home come and visit me over summer and share my favourite little places with them, sundowner sessions at Lusty Glaze, a night at The Minack theatre, a cheap bottle of plonk and a bbq at sunset on Fistral, a longboarding session at Perran Sands, surfing with seals at Godvrey, fish n chips at Jon Bouys, it goes on . Fingers crossed all goes well with the viewing and I’ll be signing on the dotted line for a whole summer in Cornwall. It’s quite something how much your situation can change in such a short space of time if you know what it is that you want. By this time next year I will also know if the 6 weeks of summer at the coast are enough or if I really do want to make a big move myself. Maybe if you get a 10 foot foamie you can surf those 4cm waves ! It must be nice to at least be able to look at the sea when you want though. There’s a plus and minus to everywhere though, perhaps being near to the sea but, having no waves would be worse than being landlocked! haha!